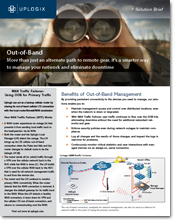 Uplogix is the most reliable and secure out-band-access solution on the market today, with more options for linking to your gear over a secondary network path. Uplogix Local Managers deliver the widest array of on-demand WAN alternative network connection options including dial-up, cellular, fiber or satellite modems provides a reliable management connection to remote gear. There is also a secondary Ethernet connection that can be used for an out-of-band connection such as a DSL modem. This connection can also route primary traffic using the WAN Traffic Failover feature and a high-bandwith OOB connection like an LTE modem. With the Uplogix rules engine, you can also configure multiple options and use rules to decide which option to use and when. One of the most striking elements is Uplogix’s management appliance with its unique mix of out-of-band management, in-band monitoring and configuration control for network devices at the edge. Uplogix can act as a backup cellular router by sharing its out-of-band cellular LTE connection with the local router/firewall/WAN accelerator. The out-of-band connection, invaluable for network management, can also be used as a failover for network traffic in the event of losing the primary connection.